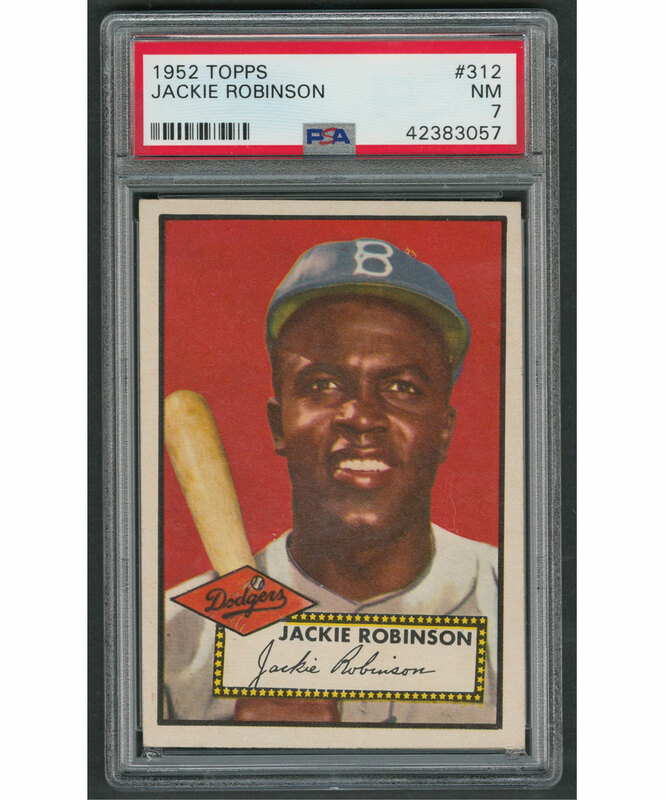 Gorgeous 1952 high number specimen up for consideration features a riveting rendition of the one and only Jackie Robinson and had survived in near perfect condition up until being encapsulated recently by PSA, the company assessing it and rendering an alluring NM 7 verdict. Marking Jackie’s first appearance on a Topps issue, card #312 helps anchor the start of the ’52 high numbers, with Mantle, Robinson, Bobby Thomson and Campanella all in a numeric row. The offered Robinson example includes a touched upper left corner and a slight diamond cut, the latter more pronounced on the reverse. This is the version that has the stitching on the back number circle pointing right (#312B). The back informs of Jackie’s 1947 National League Rookie of the Year award, his ’49 batting title and MVP season and his league-high .346 average with Montreal in ’46. A card of major importance to the ’52 Topps set and a Robinson collection awaits the high bidder.